Customer care is a very important part of our online store and a support service is essential to bring our e-commerce to the next level. 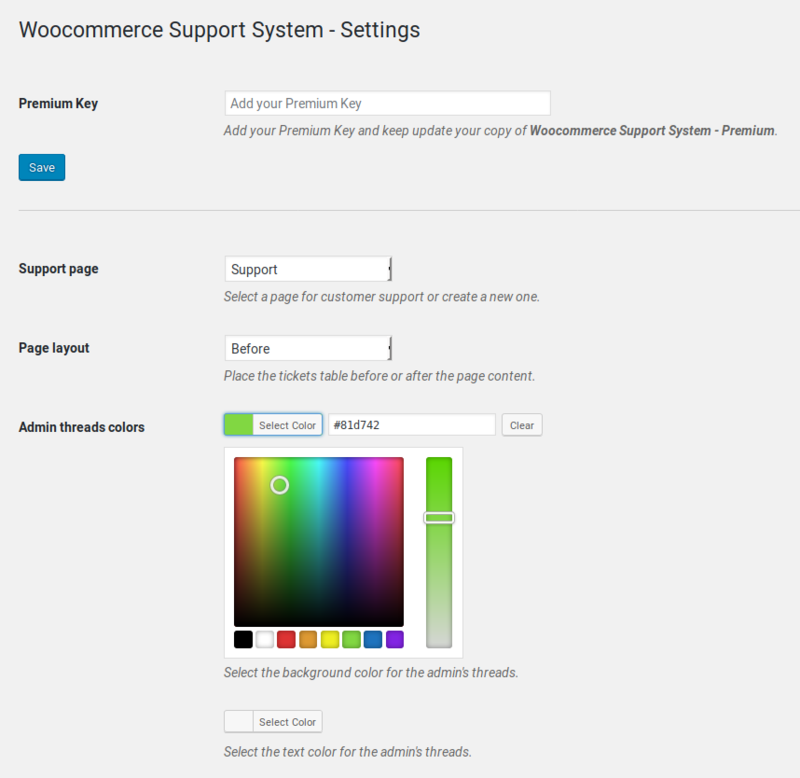 WooCommerce Support System integrates into your WordPress site a simple and fast support system, which will allow your users to open ticket assistance for WooCommerce products purchased, then receiving a notification when a reply is published. The ability to update the ticket with new messages, allows you to keep the logical thread of the conversation, making more productive your work and facilitating the user. Choose which page to use for support in front-end or, if necessary, create a new one in a second. You can also decide if put the tickets table before or after the page content. With a color selector for text and background, both for admin and user threads, you can customize the appearance of the support tickets for a perfect integration into your site style. 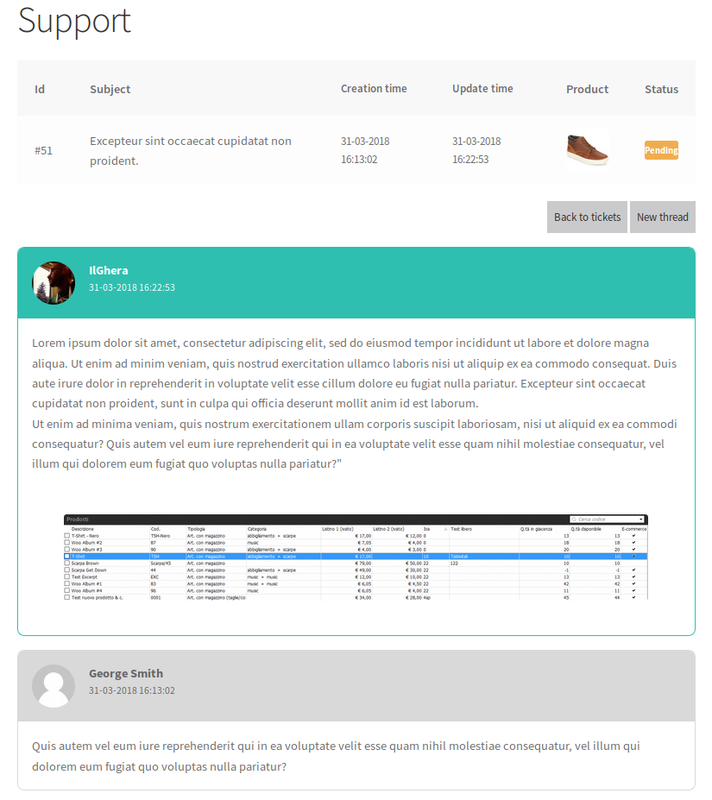 Woocommerce Support System is very easy to use for your customer. He can open a new ticket, selecting a product from the ones acquired, and write a new thread using the classic WordPress editor. A click on the single ticket will expand it showing the conversation between him and the admin. The user will ba able to add new threads until the ticket will not be set to Colsed. Manage the support ticket requests couldn’t be easier. All the tickets are ordered by default with the ones labeled Open on top, beginning from the oldest, probably the first that requires attention. The contents can be rearranged clicking on every column name, something very useful that can make faster our work. Like in front-end, the click on a single ticket shows all the conversation in it and the use of the Ajax technique, makes this action fast and efficient. Inside any ticket, clicking on New Thread makes appear a full WordPress editor, the tool that everyone expects for writing and formatting text. For changing the status of a single ticket, it’s enough clicking on the label and assign the new status from the modal window that appears. 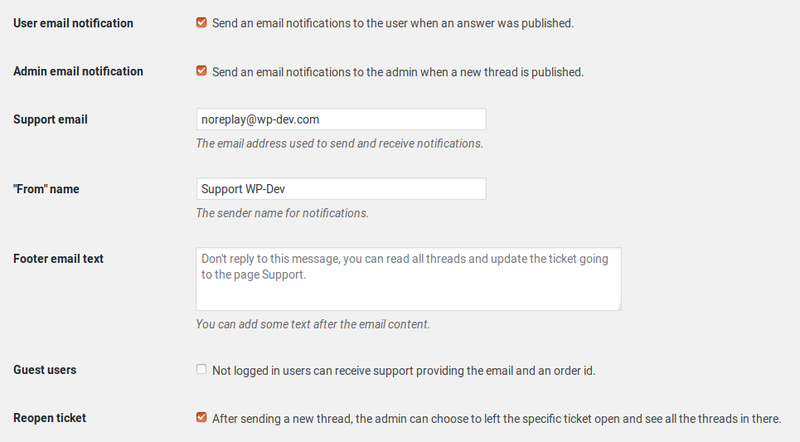 Receive a notification every time a new thread is published and let your customer to be informed if a reply was added to the ticket. If in your on line store is possible to make purchases without the need to be registered don’t worry, with Woocommerce Support System – Premium you will be able to give support to all of your customers. Flagging the specific option, not logged in users will have the ability to access to the service by providing the order id and the email used for it. If a ticket was not updated by the user from a week, for example, is possible that he has received all the needed informations, so the ticket could be marked as resolved. Instead of doing this manually and loose time, you can set the time period based on your needs, send automatically a customized notice to the user, asking him if more help is required, and close the ticket after the number of days specified.